Only lasts for 8 minutes 20 seconds and then you will have to redeploy it. It is currently bugged to visually be there after 8 minutes 20 seconds but is unusable. 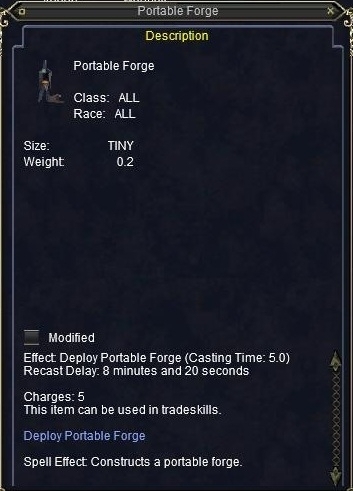 The portable forge you deploy on the ground in front of you only lasts about 8 minutes 20 seconds. Also there is a bug that causes it to remain in your view even after it poofs, until you zone or log. If you have the forge window open and try a combine but get the message "Your request failed because the item was not found." that means the forge poofed on you while you were using it. Or if you click on the forge and nothing opens except your inventory window, that also means the forge is a phantom and not actually there anymore. You'll have to deploy another forge. I deployed a portable forge today. It created a forge on the ground, all around me. I'm basically standing in the middle of it. It's a covered forge as near as I can tell. And I can't move. I'm stuck inside this thing. I can't jump. I can't even get an outside camera view to work. But I can click on it and put stuff in it to do combines. Heaven help you if a mob came up and you needed to run. You can create one 5 times, then you need a gnome to recharge it. It needs work. My gnome Morrty said "Buy it" "You'll love it! ".